Perhaps I was misled as I watched Hanna. I thought it would be an action/thriller about a teen assassin with pulsating music by The Chemical Brothers. 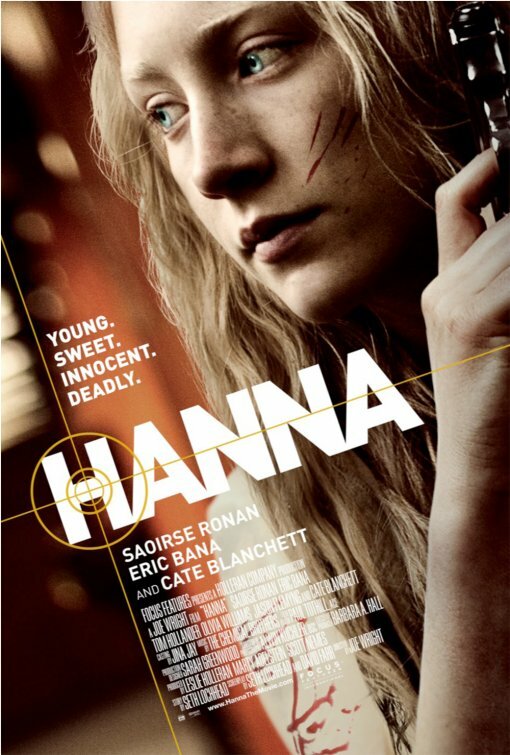 Instead, Hanna is a vaguely artsy film that involves a girl trained to kill but is both innocent child and cold killer, an odd hybrid of Frankenstein and Kill Bill. Up in the frozen tundra of Finland, we have young Hanna (Saoirse Ronan). She's your average teenage girl, at least one that's been trained in several languages and in various killing methods by her father Erik (Eric Bana). As can be expected, living in isolated Finland, she has not grown up around people or with anything close to civilization: she has never heard music or seen airplanes. All her years, she has been carefully trained by Papa Erik to memorize the house of the Brothers Grimm as a meeting point once they have dealt with the mysterious Marissa. This Marissa has been like a shadow over Hanna's life, a source of danger that she and only she can deal with at a time of her choosing. All she has to do is flip a switch. It goes without saying that eventually Hanna flips the switch, and the transmitter within gets in touch with the desired target: said Marissa (Cate Blanchett). This CIA mastermind wants Hanna and Erik taken alive. However, Erik has gone ahead to meet Hanna at the agreed meeting place and Hanna herself is captured. Marissa is suspicious, and with reason: in short order Hanna dispatches the False Marissa and makes a daring escape. We find that she somehow was smuggled from Finland to Morocco, where Hanna just happens to come across a British family on holiday. You have the dim father Sebastian (Jason Flemyng), the slightly hippie mother Rachel (Olivia Williams) and their children, sweet Miles (Aldo Maland) and bratty Sophie (Jessica Barden). From Morocco, Hanna sneaks away into Europe, hitching a ride with Sophie's family until Marissa and her minions track her down and Hanna again has another daring escape. Finally, she reaches the rendezvous point: Berlin. Marissa is in hot pursuit, aided by Isaacs (Tom Hollander), her own hit man. In Berlin, all the pieces come together: Hanna is the result of genetic engineering to create super-soldiers, but when the program was iced all the babies and their mothers were to be exterminated. Despite Marissa's best efforts, one managed to slip through, and Erik, who reveals he is not Hanna's natural father, sacrifices himself to give Hanna more time. At last, the confrontation between Hanna and Marissa comes amid an abandoned amusement park, and Hanna manages to triumph and go into a sequel, I mean, get away. I could not help think just now that the abandoned Grimm's Fairy Tale-like setting was perhaps subconsciously or deliberately taken from The Lady From Shanghai. In fact, that is one of the things I disliked about Hanna: how despite the story, director Joe Wright couldn't help himself in throwing these deliberately and self-consciously artsy touches to what should have been a good action film. There's for example, the moment when Hanna comes across Miles and Sophie. Here is this extremely pale, almost ghostly-looking girl in an orange jumpsuit coming across two kids in the desert with only the vastness of the Sahara as background. I digress to point out just how bizarre the set-up was to me, let alone the curious lapses of logic. Here is this girl wandering around the desert, obviously not a native Morrocan, and both Sophie and Miles react as if there is nothing particularly out-of-the-ordinary in this sight. That is bad enough, but to think that neither Sebastian or Rachel don't think there's anything slightly weird in Hanna just wandering around the desert with no family and no real understanding of the world around them makes them downright stupid. There is a surprising, almost shocking lack of curiousity by the British family about Hanna herself that to my mind just didn't make any sense. As I've stated, there are many shots within Hanna that call attention to themselves, from the opening of her tracking down a caribou to the final confrontation between the Southern-accented Marissa and the Germanic Hanna. Side note: I wasn't too overwhelmed with all the accents floating about, but bless Australians Blanchett and Bana for how they handled them, so they get some credit. Seth Lochhead and David Farr's screenplay (from a story by Lochhead) had me thinking of another story. There was a story I once heard of a child who was targeted for death but who managed to escape, even if it did cost the child the parent's life, and taken to be watched over by a foster parent until they were ready to meet the one who wants said child dead. Can I call her Hanna Potter? I don't want to say that there aren't things to admire in Hanna. Chief among them are the performances. Blanchett is excellent as the methodical and dangerous Marissa, a woman who is single-minded in her determination to wipe out the last of the super-children. Bana continues to impress as Erik, a man whose motives are sincere from the time of his training to his end, though again, was a bit cinematic in my view. Ronan is the real star of Hanna: her mixture of curiosity and wonder at the outside world and her efficiency in killing is remarkable and the signs of a growing talent. Take the scene in Morocco, where she is shown her room. All the electrical appliances from the magic of the sounds a television makes to the fear a coffeemaker unleashes in her, overwhelm our heroine, and Ronan's performance capture both Hanna's fascination with and fear of electricity. However, to my mind the negatives become too many to Hanna's positives. For getting star billing in the trailer, The Chemical Brother's score isn't a big part of the film. In fact, the movie is remarkable in that for long stretches there isn't much music or perhaps much music that was particularly memorable, with only the musical section Container Park worth anything. I also was displeased to see Isaac always whistling a little ditty to signal that he's dangerous. We've seen that before in other films, and it's not particularly clever or adds anything to a remarkably blank personality like Isaacs. If anything else, leaving Hanna free to walk away has me highly suspicious that Hanna is the first part of a hoped-for sequel or worse, franchise. It would be strange given that both Marissa and Erik don't make it to the final reel that Hanna would have more adventures, and it would have been interesting to see her explore the world of which she's always heard of but never actually experienced herself. It may be just my general fear and dislike of films setting up sequels, but after finishing Hanna I couldn't help think a second part would be hoped-for. There is some action, which is good for an action film, but a bit too much art for its own good. This child won't lead the way.